I got slammed hard at work on Friday and sadly was unable to get FOTD written. But I am back and ready to start off a new week with some new nibblets of trivia for your pleasure. Did you know that Leonard Nimoy refused to voice Spock in Star Trek The Animated Series unless Nichele Nicholas and George Takei were cast as well? From The Enterprises’s Computer Banks If The Enterprise Went Into Space With A Computer Containing Hulk Hogan’s Life Story. Initially, Filmation was only going to use the voices of William Shatner, Leonard Nimoy, DeForest Kelley, James Doohan and Majel Barrett. Doohan and Barrett would also perform the voices of Sulu and Uhura. Leonard Nimoy refused to lend his voice to the series unless Nichelle Nichols and George Takei were added to the cast — claiming that Sulu and Uhura were of importance as they were proof of the ethnic diversity of the 23rd century and should not be recast. Nimoy also took this stand as a matter of principle, as he knew of the financial troubles many of his Star Trek co-stars were facing after cancellation of the series. This certainly sounds like the kind of thing Nimoy would do. That said, it certainly was a risk. Anthony Paschel wrote a story for TrekMovie.com called Koenig: Leonard Nimoy Fought To Get Nichelle Nichols Pay Equity For ‘Star Trek’ + Nimoy Confirms where we learn that Gene Roddenbury refered to Nimoy as “The Conscience of Star Trek”. Emphasis is mine. According to original Star Trek cast member Walter Koenig, Leonard Nimoy once fought to get Nichelle Nichols pay equity. TrekMovie checked with Mr. Nimoy and he gave us theexclusive details. More info below. Today the Las Vegas Sun had an interview with original Star Trek star Walter Koenig to promote the big Las Vegas convention. Mostly the interview covered familiar ground but when talking about his relationship with his fellow Trek co-stars, Koenig said this about Leonard Nimoy. Koenig: Leonard (Nimoy, Mr. Spock) was always kind of unapproachable. But a very good man. Sound ethics and a good sense of morality. 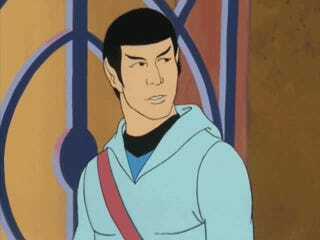 Nimoy: There was also the case where George and Nichelle we’re not hired to do their voices in the animated series . I refused to do Spock until they were hired. Mr. Roddenberry started calling me the conscience of Star Trek. The fact that Nimoy fought for Nichelle Nichols back in the 1960s shows a bit of bravery. Back then women’s pay equity wasn’t the same kind of hot topic it is today. On top of that, while he was a lead, Nimoy was still just an actor in the show and didn’t have the kind of pull he would eventually have when he went on to produce and direct for the Star Trek movies in the 80s & 90s. All in all, Walter’s story just proves what we all knew, Leonard Nimoy is a mensch. Knowing what we do about Leonard Nimoy, this should come as no surprise to anyone. The fact that he did so without the kind of prestige and power he would have later in his career when he was directing Star Trek movies shows the kind of man he was. It’s still hard to belive he’s gone. 1. This is some bad voice acting. I’m not gong to beat around the bush on that, it’s not great. YMMV but just don’t go into this expecting a lot. I got the impression that DeForest Kelly and Shatner were not that comfortable on the mic. It wouldn’t surprise me since Shatner was a stage actor. Nimoy does a decent job but that may be because of the type of character Spock is vs McCoy and Kirk. 2. If you grew up in the 80s and watched He-Man or She-ra or the non movie based Ghostbusters, you’ll know what to expect from Filmation when it comes to animation quality. I found a couple of scenes quite humorous. When the Trio is looking for the alien in the sickbay there are a couple of shots where McCoy’s head is zoomed in on to make it look gigantic, with a little big of space on the side for Spock to be standing and talking. They do this a few times, including one shot where half of McCoy’s face is literally off the screen. You see one eye and half a mouth and the rest of the screen is an empty space with Spock. Later in the clip a female officers has her gun knocked out of her hand by the fugitive alien ( HE TRIED TO KILL ME WITH A FORKLIFT! OLE!) and when she bends over to pick it up she bends almost 90 degrees at the waist like some kind of Barbie doll. I guess Mr. Fantastic’s great-great-great-grand-daughter joined StarFleet because that’s the only explanation for how she was able to get her phaser back when you see the way she bends and the length of her arms. That said, the animated series was an important part of Trek history. It produced a semi-sequal to City On The Edge Of Forever called Yesteryear that explored Spock’s backstory, which was used in both TNG Unifcaiton two-parter as well as in building the JJ-Verse Spock in 2009’s Star Trek. It was also the only episode of the animated series to be writeen by D.C Fontana. There was a sequal to The Trouble With Tribbles called More Trouble More Tribbles written by origonal episode scribe David Gerrold. There were many other bits and pieces that have been maintained in modern day Trek canon. Amanda’s maiden name, Grayson.A second exit for the bridge, referred to in Franz Joseph’s Star Fleet Technical Manual and seen in the refitted Enterprise and the NCC-1701-A from the first six Star Trek movies.The kahs-wan ritual Spock endures in “Yesteryear”.Klingon commander Kor’s command of the battlecruiser Klothos.Doctor Phlox uses Edosian slugs in his medical bay, and Chef once served up Edosian sucker fish, similar to Earth’s catfish, as a meal, in the series Star Trek: Enterprise. They come from the same planet as Lieutenant Arex, as do Edosian orchids mentioned by Elim Garak in Star Trek: Deep Space Nine.The Vulcan city, ShiKahr, has been referred to in multiple series (sometimes misspelled “ShirKahr”), and can be seen in an episode of Enterprise. A Vulcan city which looks similar to the ShiKahr of Star Trek: The Animated Series was shown in the new CGI establishing shots used in the special edition of “Amok Time”.Some of the worlds and aliens in the series were included in the 1989 book called Star Trek: The Worlds of the Federation.Some of Spock’s dialog from “Yesteryear”, and young Spock being bullied by Vulcan classmates, are given homage in the 2009 feature film, Star Trek.Kirk’s middle name was revealed in this series as Tiberius in the “Bem” episode, answering the question of what the ‘T.’ in his name stood for in the original live action series until Star Trek VI: The Undiscovered Country(although it was mentioned in the novelization of Star Trek: The Motion Picture).The sehlat’s appearance, shown in Yesteryear, was given a CGI look for the live-action series Star Trek: Enterprise. If you want to see what the animated series has to offer, it is currently available on Netflix streaming. With that, I must beam back top my ship and warp away for more adventure. I will see you all on the next Fact Of The Day. 3. George Takei. To the Stars: The Autobiography of George Takei. Pocket Books.